First and foremost, change is always viewed with skepticism. Lead acid has been the go-to for well over 150 years. The majority of industries abhor the changes and upgrades needed to adapt to new & changing technology. But, as the saying goes- the one thing that is constant is change. It is time to phase out lead acid with it’s weight, dangerous acid base and outdated efficiency. It is typically considered wise to use just 30% – 50% of the rated capacity of typical lead acid “Deep Cycle” batteries. This means that a 600 amp hour battery bank in practice only provides, at best, 300 amp hours of real capacity. If you even occasionally drain the batteries more than this their life will be drastically cut short. Even if you are going easy on your batteries and are careful to never overly drain them, even the best deep cycle lead acid batteries are typically only good for 500-1000 cycles. If you are frequently tapping into your battery bank, this could mean that your batteries may need replacement after less than 2 years use. The final 20% of lead acid battery capacity can not be “fast” charged. The first 80% can be “Bulk Charged” by a smart three-stage charger quickly (particularly AGM batteries can handle a high bulk charging current), but then the “Absorption” phase begins and the charging current drops off dramatically. Just like a software development project, the final 20% of the work can end up taking 80% of the time. This isn’t a big deal if you are charging plugged in overnight, but it is a huge issue if you have to leave your generator running for hours (which can be rather noisy and expensive to run). And if you are depending on solar and the sun sets before that final 20% has been topped off, you can easily end up with batteries that never actually get fully charged. Not fully charging the final few percent would not be much of a problem in practice, if it wasn’t for the fact that a failure to regularly fully charge lead acid batteries prematurely ages them. In addition to all that wasted generator time, lead acid batteries suffer another efficiency issue – they waste as much as 15% of the energy put into them via inherent charging inefficiency. So if you provide 100 amps of power, you’ve only storing 85 amp hours. This can be especially frustrating when charging via solar, when you are trying to squeeze as much efficiency out of every amp as possible before the sun goes down or gets covered up by clouds. Flooded lead acid batteries release noxious acidic gas while they are charging, and must be contained in a sealed battery box that is vented to the outside. They also must be stored upright, to avoid battery acid spills. AGM batteries do not have these constraints, and can be placed in unventilated areas – even inside your living space. This is one of the reasons that AGM batteries have become so popular with sailors. Flooded lead acid batteries must be periodically topped off with distilled water, which can be a cumbersome maintenance chore if your battery bays are difficult to get to. AGM and gel cells though are truly maintenance free. Being maintenance free comes with a downside though – a flooded cell battery that is accidentally overcharged can often be salvaged by replacing the water that boiled off. A gel or AGM battery that is overcharged is often irreversibly destroyed. A fully charged 12-volt lead acid battery starts off around 12.8 volts, but as it is drained the voltage drops steadily. The voltage drops below 12 volts when the battery still has 35% of its total capacity remaining, but some electronics may fail to operate with less than a full 12 volt supply. This “sag” effect can also lead to lights dimming. Lead acid batteries are made from (not surprisingly) a mixture of lead plates and sulfuric acid. This was the first type of rechargeable battery, invented way back in 1859. Lithium ion batteries on the other hand are a much newer invention, and have only been around in a commercially viable form since the 1980′s. 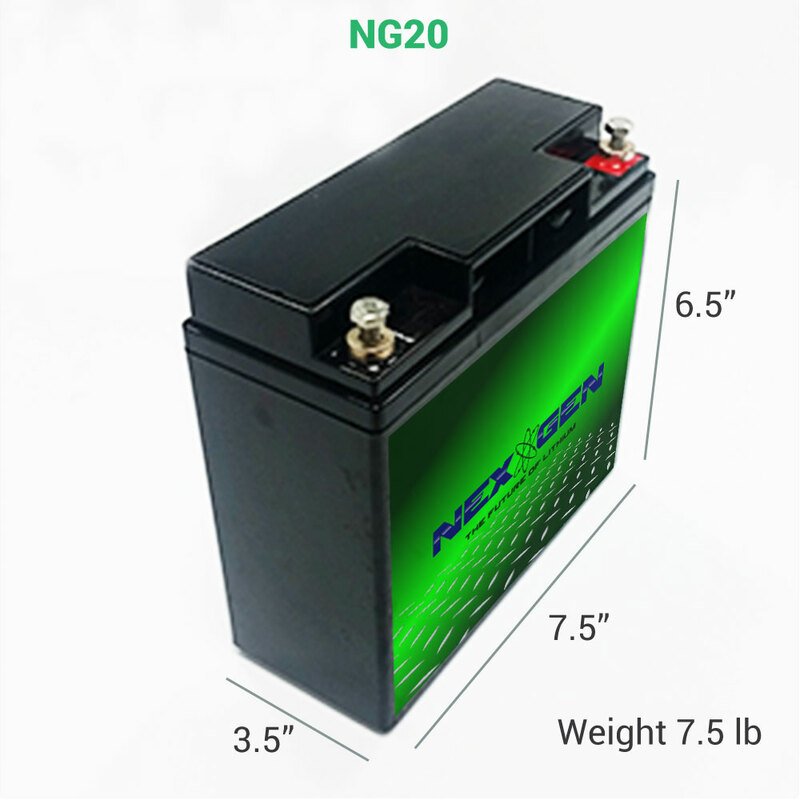 Lithium technology has become well proven and understood for powering small electronics like laptops or cordless tools, and has become increasingly common in these applications – edging out the older NiCad (Nickel-Cadmium) rechargeable battery chemistry due to lithium’s many advantages. But as you might recall from the many news stories a few years ago around defective laptop batteries bursting into flame – lithium ion batteries also earned a reputation for catching fire in a very dramatic fashion. The commonly used lithium ion battery formulation had been Lithium-Cobalt-Oxide (LiCoO2), and this battery chemistry is prone to thermal runaway if the battery is ever accidentally overcharged. This could lead to the battery setting itself on fire – and a lithium fire burns hot and fast. This is one of the reasons that up until recently, lithium was rarely used to create large battery banks. But in 1996 a new formula for mixing lithium ion batteries was developed – Lithium Iron Phosphate. Known as LiFePO4 or LFP, these batteries have a slightly lower energy density but are intrinsically non-combustible, and thus vastly safer than Lithium-Cobalt-Oxide. And once you consider the advantages, Lithium-Ion batteries becomes exceedingly tempting. Unlike with lead acid batteries, it is considered practical to regularly use 85% or more of the rated capacity of a lithium battery bank, and occasionally more. Consider a 100 amp hour battery – if it was lead acid you would be wise to use just 30 to 50 amp hours of juice, but with lithium you could tap into 85 amp hours or more. Laboratory results indicate that you could expect to see 2000 to 5000 cycles out of a well cared for LiFePO4 battery bank. These are theoretical results but recent measurement shows that a battery will still deliver more than 75% of it’s capacity after 2000 cycles. In contrast, even the best deep cycle lead acid batteries are typically only good for 500-1000 cycles. Lithium-ion batteries can be “fast” charged to 100% of capacity. Unlike with lead acid, there is no need for an absorption phase to get the final 20% stored. And, if your charger is powerful enough, lithium batteries can also be charged insanely fast. If you can provide enough charging amps – you can actually fully charge a lithium ion battery just 30 minutes. But even if you don’t manage to fully top off to 100%, no worries – unlike with lead acid, a failure to regularly fully charge Lithium-Ion batteries does not damage the batteries. This give you lots of flexibility to tap into energy sources whenever you can get them without worrying about needing to do a full charge regularly. Several partly cloudy days with your solar system? No problem that you can’t top off before the sun goes down, as long as you’re keeping on top of your needs. With lithium, you can charge up what you can and not fret about leaving your battery bank perpetually undercharged. Lead acid batteries are less efficient at storing power than lithium ion batteries. Lithium batteries charge at nearly 100% efficiency, compared to the 85% efficiency of most lead acid batteries. This can be especially important when charging via solar, when you are trying to squeeze as much efficiency out of every amp as possible before the sun goes down or gets covered up by clouds. Theoretically, with lithium nearly every drop of sun you’re able to collect goes into your batteries. With limited roof & storage space for panels, this become very important in optimizing every square inch of wattage you’re able to mount. Lead acid batteries and lithium lose their capacity in cold environments. As you can see in the diagram below, Lithium-ion batteries are much more efficient at low temperatures. Moreover, the discharge rate affects the performance of lead acid batteries. At -20°C, a Lithium battery that delivers a 1C current (one times its capacity), can deliver more than 80% of its energy when the AGM battery will deliver 30% of its capacity. For harsh environments (hot and cold), Lithium-Ion is the technological choice. Lithium-ion batteries do not need to be stored upright, or in a vented battery compartment. They can also fairly easily be assembled into odd shapes – an advantage if you are trying to squeeze as much power as possible into a small compartment. This is especially useful if you have an existing battery bay that is limited in size, but you want or need more capacity than lead acid is currently able to provide. Lithium-Ion batteries are fairly maintenance free. A “balancing” process to make sure all the cells in a battery bank are equally charged is automatically achieved by the BMS (Battery Management System). Just charge you battery and you are good to go. The discharge curve of lithium batteries (especially relative to lead acid) is essentially flat – meaning that a 20% charged battery will be providing nearly the same output voltage as an 80% charged battery. This prevents any issues caused by the “voltage sag” common to lead acid as they discharge, but does mean that any battery monitor or generator auto-start dependent upon voltage levels will likely not work well at all when monitoring a lithium bank. On the flip side, once lithium batteries are fully discharged, their voltage takes a nose-dive quickly – which is the BMS role to protect the batteries to absolutely never let this happen. Completely discharging a lithium ion bank, even once, can render your entire pack permanently dead. Another huge advantage of lithium batteries is that Peukert’s losses are essentially non-existent. This means that Lithium-Ion batteries can deliver their full rated capacity, even at high currents. Whereas lead acid can see as much as a 40% loss of capacity at high loads. In practice, this means that Lithium-Ion battery banks are very well suited to powering high current loads like an air conditioner, a microwave or an induction cooktop. On average Lithium-Ion batteries weigh 40%- 60% less than your standard LAB. That alone can save large percentages on fuel efficient or drag co-efficient ratings in almost any application. We take the example of a solar installation for a standalone building (Self Sufficient Home). The storage capacity for the battery is 50KWh. The costs of delivery and installation are calculated on a volume ratio of 6:1 for Lithium system compared to a lead-acid system. This assessment is based on the fact that the lithium-ion has an energy density of 3.5 times Lead-Acid and a discharge rate of 100% compared to 50% for AGM batteries. The cost per cycle, measured in € / kWh / Cycle, is the key figure to understand the business model. To calculate it, we consider the sum of the cost of batteries + transportation and installation costs (multiplied by the number of times the battery is replaced during its lifetime). The sum of these costs is divided by the net consumption of the system (50kWh per cycle, 365 cycles per year, 5.2 years of use). We note that despite the higher facial cost of Lithium technology, the cost per stored and supplied kWh remains lower than for Lead-Acid technology. The reason is related to the intrinsic qualities of lithium-ion batteries but also linked to lower transportation costs. This study is valid for any type of application requiring deep discharge cycle. EV traction or autonomous systems match the same criteria. On the other hand, for UPS systems or back-up batteries, the above model cannot be applied because the discharge cycles are by definition random for such systems. 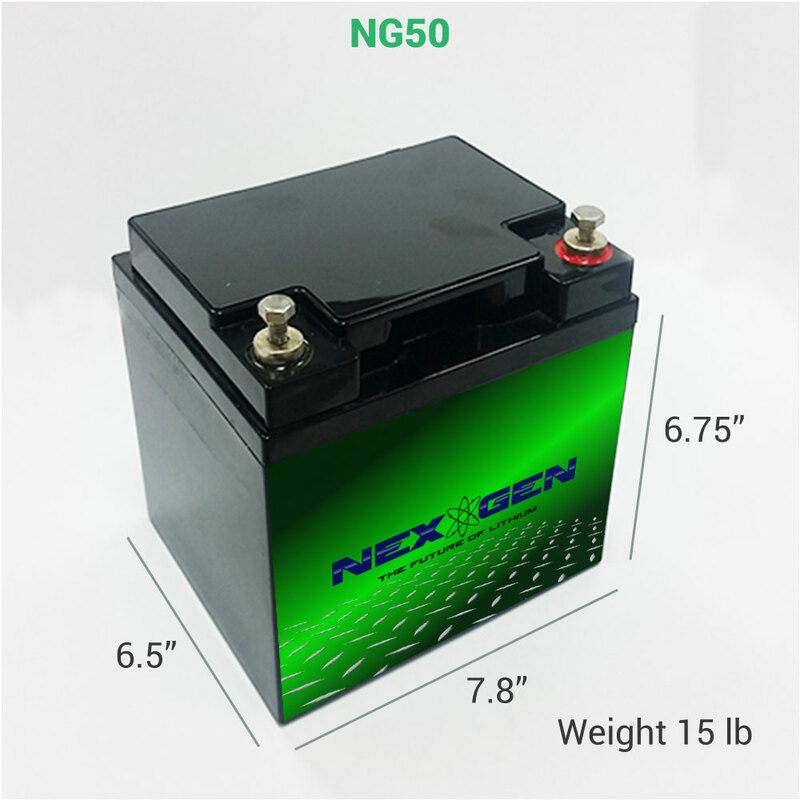 1) Weight: Lithium-ion batteries are one-third the weight of lead acid batteries. 2) Efficiency: Lithium-ion batteries are nearly 100% efficient in both charge and discharge, allowing for the same amp hours both in and out. 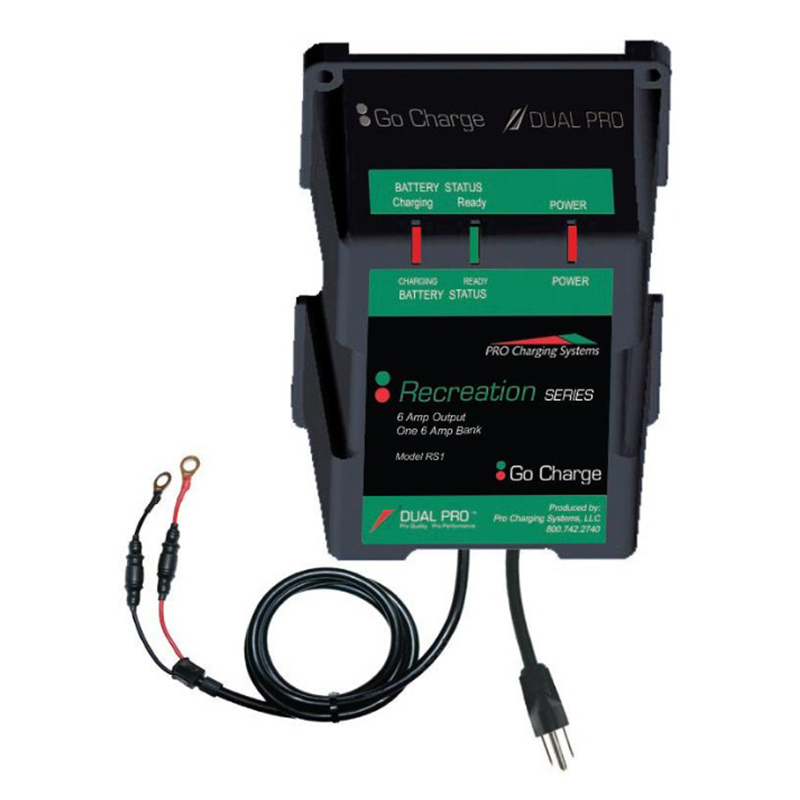 Lead acid batteries’ inefficiency leads to a loss of 15 amps while charging and rapid discharging drops voltage quickly and reduces the batteries’ capacity. 3) Discharge: Lithium-ion batteries are discharged 100% versus less than 80% for lead acid. Most lead acid batteries do not recommend more than 50% depth of discharge. 4) Cycle Life: Lithium-ion batteries cycle 5000 times or more compared to just 400-500 cycles in lead acid. Cycle life is greatly affected by higher levels of discharge in lead acid, versus only slightly affected in lithium-ion batteries. 5) Voltage: Lithium-ion batteries maintain their voltage throughout the entire discharge cycle. This allows for greater and longer-lasting efficiency of electrical components. Lead acid voltage drops consistently throughout the discharge cycle. 6) Cost: Despite the higher upfront cost of lithium-ion batteries, the true cost of ownership is far less than lead acid when considering life span and performance. 7) Environmental Impact: Lithium-ion batteries are a much cleaner technology and are safer for the environment. 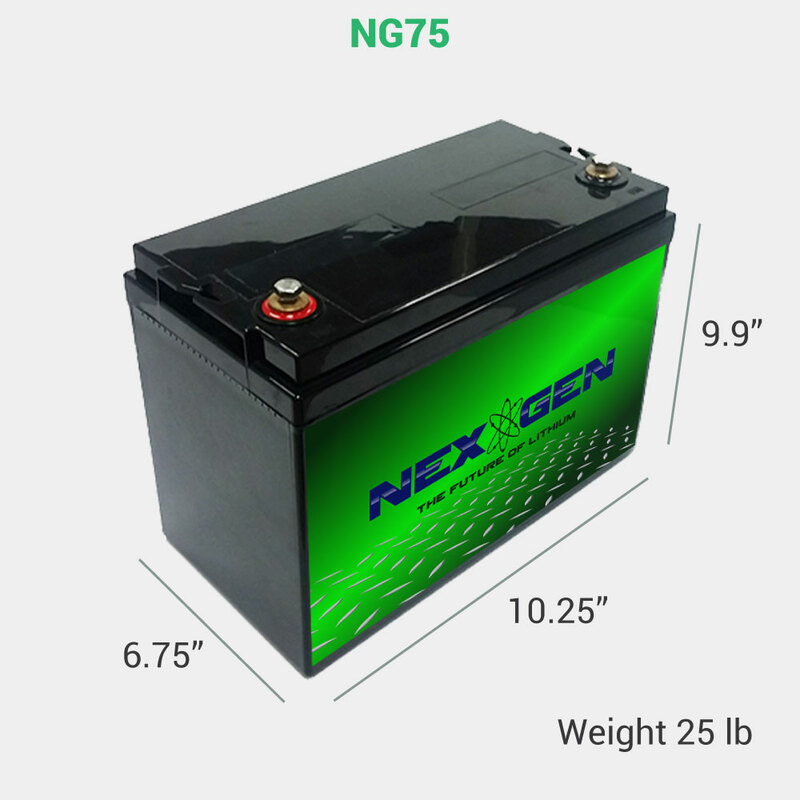 © 2019 NexGen Batteries. All Rights Reserved.